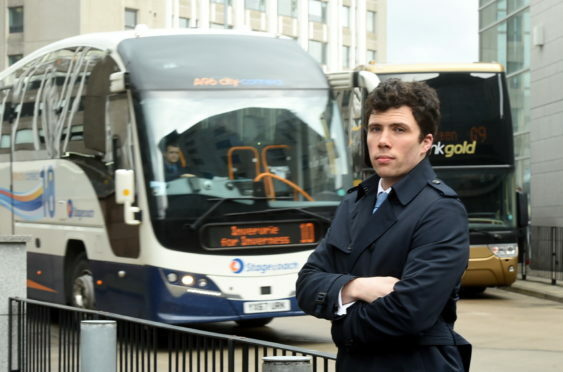 Councillor, Ryan Houghton at the bus station, Aberdeen. Talks are to be held between a city councillor and a bus giant over a potential revamp of Aberdeen’s station- ahead of a massive planned expansion of the city’s Union Square. Planning permission in principle is in place for a £200 million overhaul of the shopping centre, which would include space for 30 new retailers and a 120-bedroom hotel. But Conservative George Street and Harbour member Ryan Houghton has raised concerns the “crucial” adjoining bus station could be left behind as the mall expands. He has received a number of complaints from city residents about the quality of the facilities on offer. Bus giant Stagecoach are the lease holders of the bus station site and it is understood the current contract runs decades into the future. The upgraded bus station was opened in 2008 as a replacement for the aging previous station. Mr Houghton has now convened a meeting with Stagecoach to see what improvements can be made. He said: “The bus station is a crucial part of our transport network in the city. “Any future development of the station should ensure that it’s redeveloped with passengers in mind, not as an afterthought. “I’m grateful to Stagecoach for agreeing to meet with me to discuss both the concerns constituents have just now and also what can be done in the future. ”I’ve had a range of helpful suggestions from constituents including having a member of staff at the bus station on hand to answer timetable queries. “With the tight spacing between stands it’s not always obvious where to be, especially for people from out of town. “Others have also suggested a public address system so people know when busses are arriving and departing. Plans for the expansion of Union Square were first put forward in February 2016 and approved in July last year. Although the project’s design has not yet been finalised, the expansion will be built into the current surface car park and extended along Market Street. It has been hailed as “a vote of confidence in the city’s economy” by Aberdeen City Council’s co-leaders, Jenny Laing and Douglas Lumsden. A spokeswoman for Stagecoach North Scotland said: “We are always open to feedback from our customers on ways we can make travelling by bus easier. “We manage the outdoor area at Aberdeen Bus Station and Union Square are responsible for the indoor area within the shopping centre. “We have in the past six months introduced a full time bus station supervisor who can be easily spotted in a high-visibility jacket in the bus station to assist customers as well as our travel shop being open six days a week.